Editor's Note: Kent Keyser spent more than three decades working for a prominent member of the U.S. House of Representatives. That experience coupled with his natural resilience and optimism helped him overcome rehabilitation obstacles following a severe spinal cord injury from a freak accident in his home. Kent took charge of his own recovery and is now a national advocate for others with spinal cord injury or other paralyzing conditions. My spinal cord injury (SCI) was the result of a fall in my basement in 2007. It was a C3, C4 incomplete injury. I use a power chair but can do some limited walking with human assistance, primarily to maintain my balance. For exercise, I walk 20–30 minutes a day, 20 minutes on gym days, when I use machines (again with assistance) for arms, shoulders, back, chest, legs, and any other muscles my adaptive fitness trainers can find to hurt. Those accomplishments didn’t happen overnight. In the more than 10 years since my SCI, adaptive fitness has driven my progress with physical therapy, strength, range of motion and, as a result, my independence, which like everyone else, I cherish. I also am a firm believer that good health is the foundation of an independent and productive life. Couple adaptive fitness with good nutrition and you have a good recipe for a life of accomplishment. I was privileged to do my inpatient rehab at Washington, DC’s National Rehabilitation Hospital (NRH). NRH is a wonderful institution with a dedicated and seasoned staff. But its livelihood, just like all rehab hospitals, is dependent upon the reimbursement policies of private and public insurance programs. In short, the current insurance programs did not allow me to stay at NRH’s inpatient program before I was finished with my rehab potential. So I immediately entered NRH’s fantastic outpatient rehab day program only to be tossed out again long before I had reached my full recovery potential. During the last weeks of the NRH rehab day program, I began contemplating how I was going to rehab more fully. One of the therapists there, Devon Palermo, explained he was working privately with some SCI clients to build their strength and range of motion. He said there was growing literature indicating such activities may well “wake up neurological connections” and renew cellular abilities. Post NRH’s day program, I began adaptive fitness with Devon. 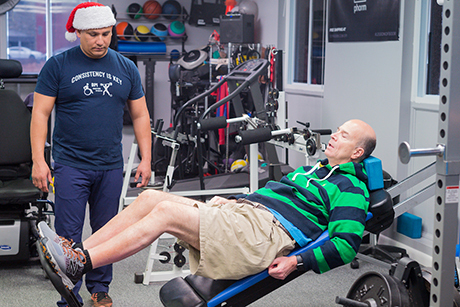 Kent Keyser at NRH’s Adaptive Fitness Center in Washington, DC, with his personal assistant, Pablo Hernandez, of DPI Adaptive Fitness. On a day-to-day basis, no individual has been more valuable, more key to my progress and success than my long-time, almost 10-year personal assistant, trainer, nutritionist, counselor, coach, all-around adviser and guider, Pablo Hernandez. Pablo, in more ways than one, has really led my team and deserves credit for the tremendous recovery I have made physically, mentally, and with my living environment. A year or so after Pablo came on board my team, I had lost 40 pounds, was well into my walking regimen, and had moved from a hospital bed in my dining room to a regular adjustable bed in my upstairs bedroom. Yes, that spells walking up and down stairs daily. I went from sponge baths to using my shower and now sit in a regular chair to eat breakfast at my dining room table that is out of storage—all this and a million little new things Pablo nudges me to do each day. I’m very blessed, very fortunate, and thank my lucky stars every minute of every day. Through successful rehabilitation efforts—and with the full support of his employer and workplace accommodations—Kent returned to work and resumed his full job duties as chief of staff for Congressman Nick Rahall of West Virginia. He remained there until Rahall left office in 2015. His gratitude runs deep and is what motivated him to join United Spinal’s team to pay it forward. Today Kent’s advocacy work encompasses many issues, including access to fitness resources at local gyms for people with SCI and other paralyzing conditions. His personal gym routine takes up to three hours a day, multiple days a week, including Saturday treks to the NRH gym’s Adaptive Fitness & Sports Program in DC and additional workouts with Pablo’s help at a gym near his home. United Spinal Association is profiled in the 2018 first quarter Medical Rehab Connection newsletter. It is a member of CARF’s International Advisory Council . Jas - Pablo says, Hi, too! Jasleen, my first rehab PT! Wonderful to know you still remember me, thank you. You set me on the right course, and for that, I will always be grateful. Great article Kent. Great to hear how well you are doing and keep up the hard work! Thank you, Devon, for your leadership and commitment to adaptive fitness. You have a great team at DPI. Thanks for sharing your story Kent!